Rotel RA-1520 review | What Hi-Fi? 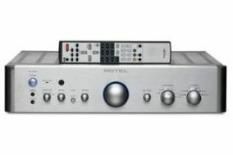 For all its undoubted (and well-documented) expertise where budget stereo amplifiers are concerned, Rotel has bitten off a mouthful at this step-up price level. It's chosen to launch its handsome new RA-1520 right into an already fiercely contested sector, where anything other than a bull's-eye, performance-wise, is going to leave it struggling to compete against the champ amps. First impressions are pretty positive. The RA-1520 apes the looks of Rotel's current range of splendid multichannel receivers – the machined logo on the fascia is an expensive-looking flourish – and specification is right on the money. If five line-level inputs, a moving-magnet phono stage, 3.5mm fascia input and switching for a second set of speakers doesn't do it for you, you're expecting too much. Only the bog-standard remote and inconsistent shades of blue from the fascia lighting give any reason to frown. It doesn't take a long listen to realise that Rotel has delivered an amplifier that offers a genuine alternative to our established Naim Nait 5i and Roksan Kandy K2 favourites. The Yeah Yeah Yeahs' It's Blitz is a formidable test of timing and dynamics, but the RA-1520 dispatches the album without breaking sweat. Informative, exciting and unflustered by complexity or sheer attack, the Rotel exhibits the sort of deep-breathing assurance that's the mark of an amplifier in control. Low frequency presence is generously proportioned enough to make a dance tune thump, but controlled and well-timed enough to make it danceable, too. Rahsaan Roland Kirk's Rip, Rig and Panic shows the other side of the RA-1520's nature. This amplifier has an impressively agile way with transients and the leading edge of notes, which makes its midrange sound intimate and expressive, and when it comes to detail extraction it's almost a match for anything else in this price bracket. It's not the very last word in fluency or delicacy, but it more than makes up for that with sheer brio. This infectious enthusiasm only gets more pronounced as you wind up the volume control. Despite some stiff competition, this Rotel has plenty to recommend it.